Quick Easter Bunny Shaped Rolls or “Bunny Buns” are made from frozen and thawed dinner rolls shaped into cute Easter Bunny’s. The twisted dough forms the ears and body of the bunny bun. So adorable!!! 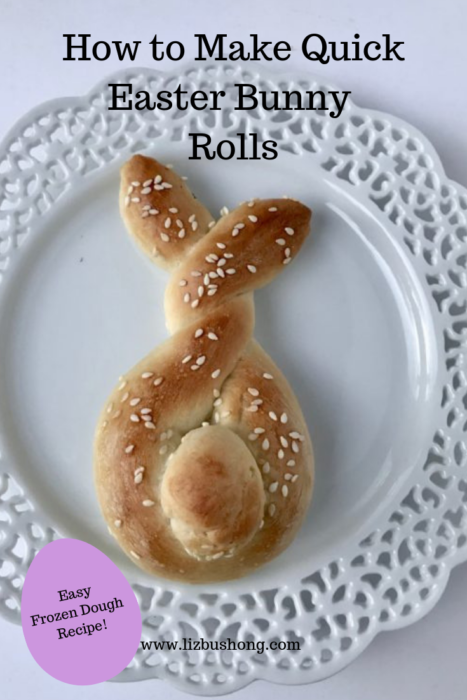 Quick Easter Bunny Shaped Rolls are perfect for any Spring entertaining events including baby showers. Dinner Rolls can be found in freezer section of your favorite grocery store. 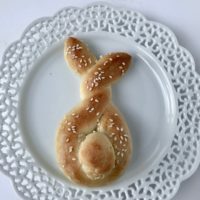 Inspired by Rhodes Dinner Rolls, these quick bunny buns are so adorable. Thawed but chilled dough is rolled into a 12″ skinny rope then twisted 2″ from the end points of rope to form a bunny body. A separate piece of dough is rolled into a small ball to form tail. Preheat oven to 350 degrees. Lightly spray baking sheet with cooking spray. Thaw dough rolls 15-20 minutes at room temperature. Cover rolls with lightly sprayed plastic wrap during this process or use a tea towel. Rolls should be chilled when ready to roll. Pinch off a small amount of dough from each roll to form the bunny tail. Roll these balls into a round shape and set aside. With remaining individual rolls, roll each one into a 12-14″ long skinny rope tapering the ends of the rope to points. Pick up the rope and about 1-1/2-2″ down from ends of rope, overlap and twist the two ends together to form the body of the bunny. Place on baking sheet. Place an indention into the base of the body and attach tail with small amount of water. Remove wrap, brush with egg wash and sprinkle with sesame seeds. Bake 350 for 12-15 minutes. Make sure you select frozen raw yeast dough rolls and not rolls that are pre-baked. You can substitute a frozen loaf of bread for the individual rolls if you can’t find the rolls, just cut the loaf in several equal pieces for shaping and rolling. If you have trouble rolling out the logs, allow the dough to sit a few minutes and then roll again. The glutens in the bread needs to relax more so you can roll out. Do not allow the rolls to over rise, they will lose their shapes during baking. These can be served as a side for salads, in a large basket for a buffet table or at each place setting with a name place card. So cute and fun to share with family and friends. You can make and bake ahead, then freeze until ready to serve. But these are best served the day you make and bake them. You can only refreeze them after they have been baked. Enjoy!